When you can't trust yourself to know when you're too tired or stress out to drive? There's now a T- shirt for that. 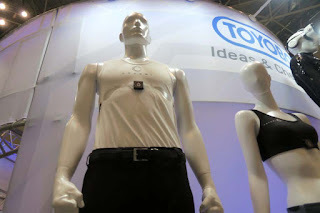 Japanese company Toyobo has teamed up with Union Tool to create Cocomi, a drowsiness detecting shirt that identifies electric signals of the heart which indicate the onset of sleep. There are around 100,000 police-reported crashes in the US due to driver fatigue, estimates the National Highway Traffic Safety Administration . Meanwhile, it's estimated that between 20 and 30 percent of crashes in Australia are caused by driver fatigue. Over in Japan, traffic deaths are at an all-time low, dropping 5.2 percent last year, reports The Japan Times . The fall is attributed to better car brakes and safety measures, but Toyobo wants to drop incidents even further by curbing fatigue-related crashes. The Cocomi undershirt is currently being tested in parts of Japan by the Chuichi Rinkai Bus Company, according to the Japan Times, fitting the many drivers that work long hours with the sleep-detecting clothing. When in use, the Cocomi should sense changes in the user's biometrics then sound an alarm to alert the driver if necessary. Cocomi is expected to be released some time later this year.